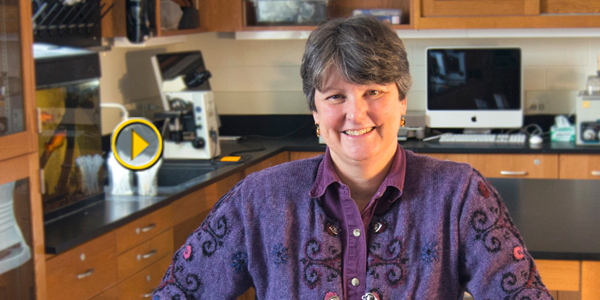 Biology professor Dr. Barb Hager has taught courses in the biology and environmental biology programs at Cazenovia College for 17 years. In that time, Hager has taught over 30 different courses from Animal Behavior to Diversity of Life, Environmental Interpretation, Field and Natural History, and Zoology. Hager brings an extensive background into the classroom and continues her lifelong learning through her own personal research on dragonflies and other insects. She earned her bachelor's and master's degrees in environmental and forest biology at SUNY ESF. As a student, Hager found a passion for field biology, evolutionary biology, and animal behavior, in particular insects. From that point, she continued her education by completing a doctorate in evolutionary and organism biology at the University of New Mexico and conducting a post-doctorate research project on the genetics of pheromones. "After I completed my post-doctorate research project, I decided that I wanted to pursue a teaching position," says Hager. "I started teaching at several liberal arts colleges before finding my way back to Central New York to teach at Cazenovia College." Why Did Hager Choose to Teach? Teaching chose Hager. She loves interacting with students, learning new information, and making discoveries. So teaching is the perfect fit! As a graduate student, Hager was a teaching assistant and through that experience, she discovered a passion for teaching. "I love giving information, discussing all sorts of different biological points… so I guess teaching really found me," says Hager. Hager adds, "I love the interaction with students and getting to know them on a very personal level. And then watching them succeed through their four years and after college." Hager believes that Cazenovia College is special because it offers students small class sizes, close relationships with faculty, and the ability to conduct research. Students have the opportunity to conduct research that interests them and even publish the results as undergraduates. Advising plays a special role at Cazenovia College. Faculty not only help students choose what classes to take, but they also help them select classes that will set them up for a successful future. "Students come into your office and you talk to them about career opportunities. We try to get them to keep an open mind, encourage them, and that is the most important part about advising," expresses Hager. Hager shares that advising is an extension of the classroom. It is an opportunity to mentor students in a one-on-one setting to help them become successful. It is also about helping students land internships and jobs by being a reference or writing letters of recommendation. "Advising gives us the opportunity to see our students develop from what they have done in the classroom to what they learn in an advising situation, and then move forward with this information into a career," says Hager. Hager teaches her classes semi-socratically–meaning that she does not solely lecture, rather she wants students to think and discuss information and ideas. "There is always that ah-ha moment when a student gets it. The students not only get the information, they also create new ideas. I watch as their eyes light up and they smile with excitement, and all of a sudden, the excitement level in the room rises. That's the most rewarding moment in my classroom," Hager shares. She adds, "I want students to really think, not to take things at face value, but really evaluate what they’re hearing, the evidence for it, and come to an informed decision." Hager also talks about the moments when students come up with new ideas. After teaching for 25 years, Hager continues to learn along with the students. Students are coming up with new ways to think about different topics that provide Hager with ah-ha moments all of the time. Students have been involved in some of Hager's personal research projects on dragonflies, as well as presenting on other topics of interests at conferences. Hager adds, "Normally graduate level students – or professionals - are presenting at conferences, but some of our undergraduates have demonstrated their research at conferences via talks and poster presentations, which is a significant accomplishment." 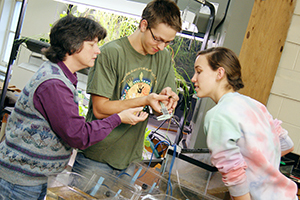 Many of the biology and environmental biology classes are conducting research in the laboratory or field. Because of the close proximity to different lakes, ponds, forests, nature conservatories, and parks, students are in the field gaining hands-on experience from their first year. Technology today provides students with an abundance of information. Hager believes that technology presents a bit of a challenge. She comments, "There is so much misinformation out there on the internet." "Technology is a blessing and a curse. Students can read about anything-like a treatment or cure- for which there is no real scientific evidence, so it is a challenge to get them to evaluate all the information they read," says Hager. In Hager's classes, she teaches her students to search for new information but also evaluate everything they read. They must find evidence to back up an article, evaluate sources, and make an informed decision based on that information. "I am always proud of my students. I am amazed by what they can do and their skill level," says Hager. "They complete graduate level work as undergrads, and go on to graduate school and careers in all different areas." Hager reminisces about her alums who have gone on to careers as naturalists, researchers, professors, arboretum staff, and much more. Hager also shares a story about a student with a fear of insects. "One student wanted to go to Australia with me for a course that I taught a number of years ago, but she was deathly afraid of spiders. We worked with her on her fear and she was able to build up her tolerance to touch the hissing cockroaches and tarantula before we went on the trip," Hager laughs. Hager also serves as the faculty athletic representative and Title IX Deputy Coordinator at Cazenovia College. She is responsible for monitoring the student-athletes’ academic progress and attends many of the events to show her support. As many other professors, Hager is also active in research. She is currently working on a study about dragonflies and their distribution over different waterways across New York State. Her research has allowed her to work with the DEC and the Natural Heritage Program to monitor the dragonfly population locally. These connections are valuable as she helps students find internships and jobs. At Cazenovia College we welcome new students with open arms. Faculty enjoy engaging with them and mentoring them. "We try to encourage our students at every step, because they come in somewhat intimidated at times and we want them to be happy and comfortable here," adds Hager. Hager also wants parents to know that their students will be challenged. She says, "They are going to be challenged both academically and personally to do their best and achieve the best they possibly can." "We want them to go from first-year students to mature, responsible adults, eager to grab the world by the tail and succeed," comments Hager. Learn more about Hager through our Faculty Spotlight video.